In the photo is Vasyl Pelysh, from Aidar Battalion. Vasyl, is my brother. His arm was chopped off while in captivity with an axe. On his hand was a tattoo with the inscription “Glory to Ukraine.” Vasyl’s mother is raising money for a prosthesis, which is very expensive, and they cannot afford to pay for it. Ukrainians, every hryvnia, dollar or euro that you give or have given carries great weight! Those who wish to donate to Vasyl’s prosthesis I give you his card number: 5168755391013576, and his mother’s phone: 0972123343 Tanya. Vasyl recently returned from the east, where he took some “humanitarian aid” for his fellow brothers … additionally, he had to go there to provide a document from headquarters that he really was in the war, and that he lost an arm also in the war, and that all the injuries he received were also in the war – it’s just like that … and his mother’s soul is being shredded from such abuse. 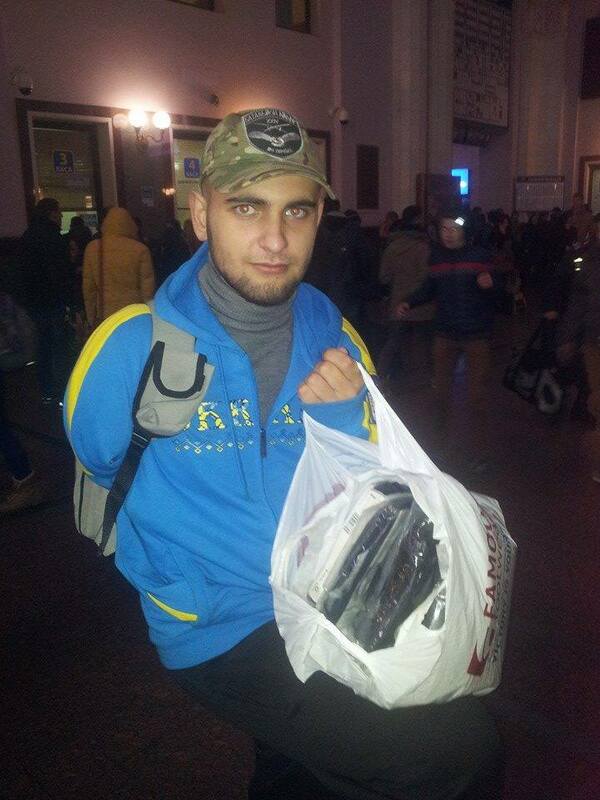 “19 year old Vasyl Pelysh, from Staryi Sambir, Lviv region, spent a month in terrorist captivity. 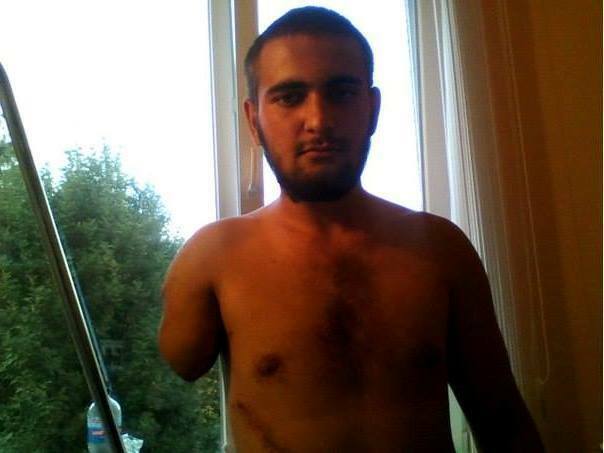 Insurgents axed off his right arm because of a “Glory to Ukraine” tattoo. Pelysh was liberated from captivity last Saturday. Now he is being treated in a military hospital in Lviv. We agree to meet on Wednesday afternoon. For Vasyl, examinations and procedures are ending. Doctors are looking to see how they can save my leg. In the left knee a fragment lodged, hit a nerve – says Vasyl Pelysh. Since June, he has served in the Aidar Battalion. He fought in the Luhansk region. – He is left without an arm, but he’s alive. Too bad, it was a nice tattoo, the emblem and “Glory to Ukraine.” He had it made a month before he lost his arm. He was captured by the terrorists on August 26. Near Novosvitlivka they wounded one of the soldiers. Vasyl was driving him to the hospital. A second soldier’s belly was half blown away. They tried to call for an ambulance for a long time. But in vain. Finally they loaded him into a UAZ. They wanted to drive him to Khryaschuvate to the hospital. He was hurrying and he didn’t take with him neither body armor nor grenades in case he got captured as a prisoner – said Pelysh. They held Vasyl Pelysh in a Luhansk hospital. Talks for his release from captivity were led by the NGO “Social Movement of Ukraine” and leaders of the group “Milestone” from the Aidar Battalion. Originally they wanted to exchange Vasyl for 14 militants. If anyone in the West can donate an arm prosthesis, please contact Pidmoga.info (below) Thank you! This entry was posted in English, English News, Help for ukrainian wounded, Pictures, South&Eastern Ukraine, War in Donbas and tagged #RussiaInvadedUkraine, #UkraineUnderAttack, Heroes, Ukraine, volunteers. Bookmark the permalink.